Breakfront Bookcase Final Work . Since my last entry I have molded the shelf fronts, made the cornice , installed the pulls , catches and glass. My client ended up choosing a lighter finish than I had originally envisioned. I designed the moldings on the doors, frames and cornice with the idea of dark wax highlighting the individual shapes. In the end we are doing a light amber finish reminiscent of Pugin furniture. At least that's how I decided to look at it. I try to be historically accurate about things like construction techniques, materials and finishes so in my opinion this is a color that you wouldn't see until the 1830's . I did however add some book slides that I borrowed from a French bureau plat design, so I'm not exactly making an identical reproduction. I also want to make the client what they want so here it is. I'm actually learning to like the color more and more. I'm setting up for the final photos for the website. This is a huge disruption to my workshop because benches need to be moved and there are about ten pieces of furniture in the room. Trying to avoid the chaos of the shop showing up in the reflection of the glass will be a challenge. I still need to fill it with furniture books for the final photographs. Images below will show some of the progress with explanations. This shows me molding the front edge of the bookshelves by hand with a homemade scratch stock. This shows the completed cornice. There are five different molding shapes that had to follow the projecting breakfront shape. 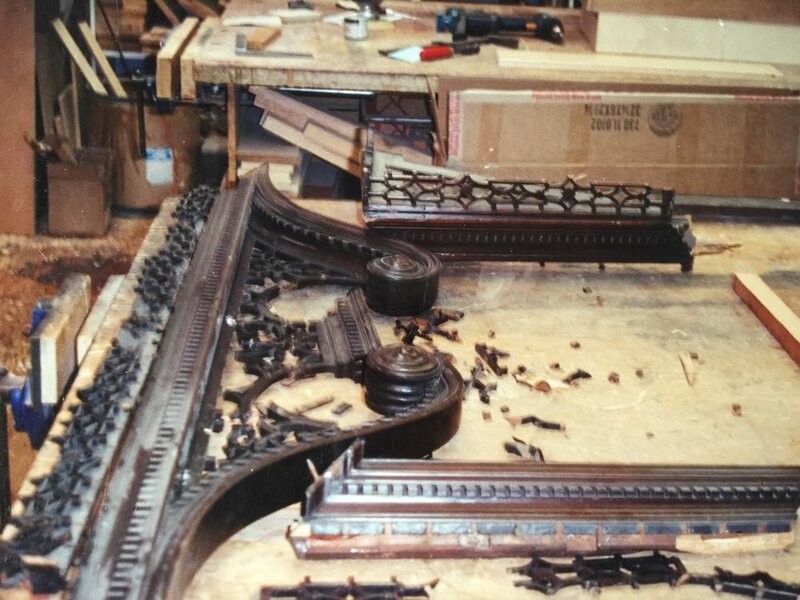 Each molding custom made but many of the profiles are from Chippendale's Director. Once completed the whole thing had to be disassembled for finishing. I used different grades of shellac applied with a pad and brush for the moldings. This is the upper left side showing rather nice figure in the oak. The lower section reassembled with the waist molding and sliding mechanism. A view of the waist molded area with the right slide partially pulled out. You can see how each box was hand dovetailed and the nice figure of the oak. Molding to support the glass being fit. Here I'm installing the glass and gluing in the molding. I'm using a technique I learned from my life as a guitar maker to clamp the small bits of molding. The horizontal sticks are "go" sticks. They are slightly longer than the space between the stiles and are wedged into place. Once the glue is dry they are removed. Glass installed and awaiting final assembly. Here's the bookcase sitting on photographic paper. I need to fill it with books, then get the tripods to support the paper above the top and hopefully get some decent photographs. I've been working on the waist moldings and sliding frames the last few weeks. The idea was taken from French bureau plats of the 18th century which is essentially the same time period that I designed this English breakfront. I haven't seen any precedent for this design but it's not an unreasonable idea and it's a good reason to hire me to make a custom piece of furniture. The undulating moldings on the base, waist and cornice definitely slows things down more than I expected. The effect is ultimately nice but each frame takes three times as long than simple rectangular frames. I'll explain the images below. A very crude scetch of the lower and upper, sliding thumbnail molded frame. The waist moldings just placed on the lower section at this point. The frames slide left and right and use the center brace as a stop. The center brace is dry fit and removable to insert and remove the sliding frames. The brace has a stub tenon and a half lap joint. This reveals an opening for the tongue on the slides to be inserted or removed. The tongue for the slide is lined up for removal from the rails. One of the sliding frames just before glue up. All mortise and tenon joinery. One of the tongues just before gluing into a mortise on a slide. The grain of the tongue needs to be at a right angle to the slide for added strength. This image shows how the nicely figured oak slides are cantilevered from long rails that will remain under the upper section of the bookcase. Corner detail of bookcase with the upper section in place. The slides are not noticeable. The slides still partly extended will pull out about 20 inches. Current state of progress. The cornice needs two more layers of molding before it will be completed. I was commissioned to build 5 chairs to match a set of George III period chairs a few years ago. I needed to make the chairs using traditional joinery, copy the carving and match the finish. I often refer to them as the Prince of Wales chairs because of the distinctive Prince of Wales plume carved on the splat. It's a common decorative motif of the period and was used in different applications (above mirrors for example). I've seen one or two versions of this model of chair in auction catalogues over the past 20 years. I like to make a set of chairs from the same board when ever possible for consistency of color and grain. I often make an extra chair if I can to work out details and I either offer it to the client (for sale) or keep it. They usually buy the extra one. I'll show some of the stages of construction with descriptions below. After tapering the legs I use a cutting guage to mark the recessed field of the legs. I use a gouge and various hand tools to flatten the recessed field and define the beads at the edges of the legs. I'm nesting the rear posts for the chairs out of a single 8/4 piece of genuine mahogany. The plywood template was made from my drawings. I lay out the chair posts left and right essentially bookmatching them at the top of the post closest to your eye to maximize the symmetry of the posts on the finished chairs. Fairing the rear posts with a spokeshave. Glueing up the rear seat rail and the bottom of the splat. The mortise and tenon joint that connects the rear posts to the crestrail. I'm using a spokeshave to form the curved board that I will use to cut the various parts of the splat. A process shot of carving the Prince of Wales plume. 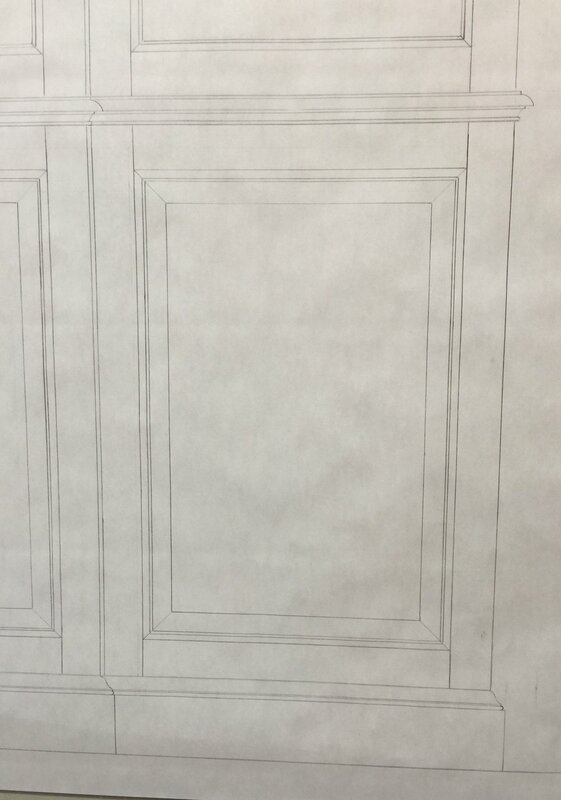 I have cut the recessed field on the crestrail and carved the reeded area on the center element. I left some wood to provide strength while carving the plume. Carving getting closer but the center "stem" on the left needs to be thinned down and tightened up among other things. My chair and an original. These images and descriptions are of the Baltimore card table I made in 1996 as a student at the North Bennet Street School. As one of my instructors, Will Neptune told me, "Your not hear to make furniture, your hear to learn how to make furniture". This project had a lot of techniques used in Federal Furniture making, bricking veneering, making fans, making bandings, making patera and inlaying everything. Because it was a card table it also had two movable gate legs. This table was based on one from the Kaufman Collection that was in a catalogue from their show at the National Gallery. I learned a great deal on this piece. This is the finished leg with the bellflowers hanging from the little black and white string a detail that connects the design to the Levin Tarr group. This is how I laid out the ebony and holly for the banding that runs along the bottom of the apron and across the legs. Glueing the strings around the central ellipse. Fitting 8 pieces of tulipwood around the ellipse to provide perpendicular striping. This is then trimmed by eye and wrapped with two more strings. Sand shading holly veneer for the petals. Cutting the elongated center petals. Inlaying the center petals last after inlaying the two flanking petals. This distinguishes Baltimore from Boston where the center petals are inlaid first and are not elongated. An assortment of projects over the past 20 years. I posted a series of what I referred to as odd ball projects on Facebook recently and I thought that some of those images as well as others would show the variety of work that I've done over the years. While I have worked on countless pieces of English, American and French 18th century furniture over the years, a degree of discretion is necessary because the work was done for antique dealers. 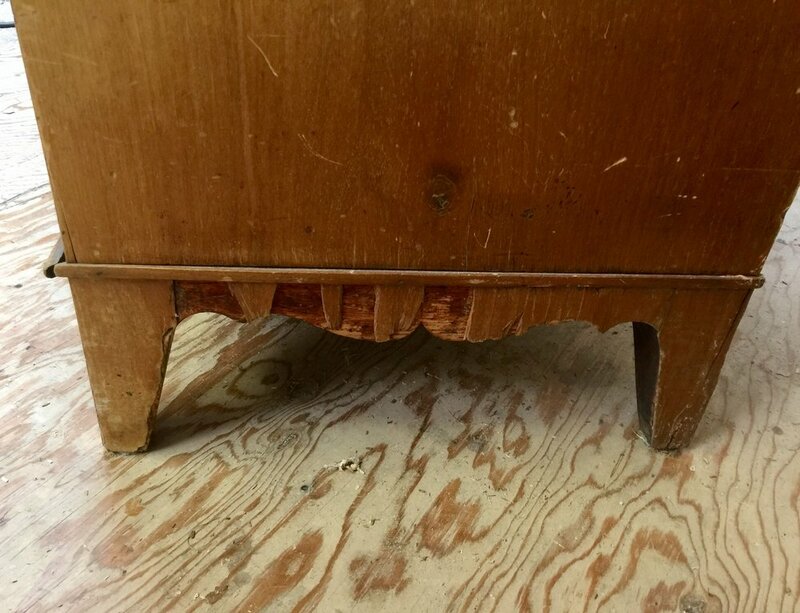 The work was done to the highest standards but showing someone else's furniture in a state of disrepair needs to be done without hurting anyone's ability to sell an object. For the most part I thought I would post images of projects that were not the ordinary restoration work I do like patching losses, structural work and finish work. With a few exceptions these are non-furniture projects. Many of these images were shot on standard film and not of the highest quality, my apologies for some of them but in most cases they are the only images I have of an unusual project. I thought it might be interesting to see the object despite the less than ideal quality of the photograph. I'll include descriptions with the images. This is a set of regimental drums that I restored sitting on a minimal stand that I built. The drums are English and date to the 1850's or so. I worked on several drums like these over the years. This early bicycle I believe is French and dates from 1840-1860 . I'm no expert on this subject but that is what I've been able figure out from my modest research. I did some minor restoration to the bicycle and made some ebonized brackets to display it on the wall. This is a tabernacle that I built for the Catholic Church to loosely match the oldest tabernacle in the United States. The original is in Maryland and a photograph of it will follow. The clients kept wanting me to water down the design but I really wanted to be fairly accurate. This image shows the piece near completion. I hadn't applied the bronze mounts yet and I still needed to turn a finial to match the original which I also gilded. They had put a drawer pull on top of the dome for some reason. I also turned a series of details above all the capitals. The side opens up to store the objects used for the Eucharist. The key to lock the door can be seen in the photograph. The original tabernacle sitting in a slightly undignified way, on a filing cabinet in Baltimore. I believe it dates to around 1680. A broken pediment for a George III breakfront bookcase. It arrived in a box containing hundreds of pieces. The tallest things I've ever turned are these bedposts for this bed I made 15 years ago. The posts are 8 feet tall and are based on a pattern in Hepplewhite's pattern book. While the painting isn't to my taste, it isn't all that different from the green and white painted furniture that Chippendale made for David Garrick. The smallest turning I ever executed was this imitation ivory pull (one of about 4) that I made for a snooker board. I placed a dime in the photo for scale. Something like 5/8 of an inch long by 1/16 of an inch. This is one of four feet that I turned and carved for a low bed based on several Indian examples. The form is reminiscent of Indian glass and bidri ware hukah basses of the 18th century. I made many display stands for a wide variety of objects when I first arrived in California. This one is relatively simple ebonized stand to hold a pierced metal fish ( maybe a weathervane). I have been lucky enough to have worked on a variety of different things over the years. One project that was a bit different than the usual bit of restoration that I do was this 18th century hurdy gurdy. It has a wheel that is charged with rosin that is cranked by a handle continuously bowing strings similar to a violin. There are drone strings and a keyboard that plays a melody on other strings. This instrument was missing the curved cover over the wheel. I made one to match out of ebony and ivory that I recycled from old piano keys. I inlaid mother of pearl bits to match the rest of the instrument. There were missing violin type keys and a missing ivory detail in the headpiece of the woman at the top of the instrument. I also had to design and build a way to display the piece that would allow a person to easily remove the piece from the stand . I did this by having small dovetailed buttons that could be pulled out when needed. These images are from 2002 like the campaign table in earlier postings and were shot on standard film. Detail of the curved wheel guard that I made from ebony, ivory (from recycled piano keys) and mother of pearl. Imitation ivory inlaid into the headpiece of the woman and a few copies of the violin type keys that I made to match. An image of the stand and instrument from behind. The sliding dovetailed keeper to hold the instrument and that can easily be removed when necessary. When I agreed to make the campaign dining table in the manner of Charles Stewart I worked out most everything from a few photographs. I did manage to get a copy of the patent for the table, with the help of my client, from the British Museum but it was only modestly helpful. The table dates to 1810 but for some reason the copy of the patent dated to 1840. The conventions of drafting were not standardized at this time and a lot of information was missing. I made a full scale drawing and a full scale model to work out all the sliding frames and rotating parts. 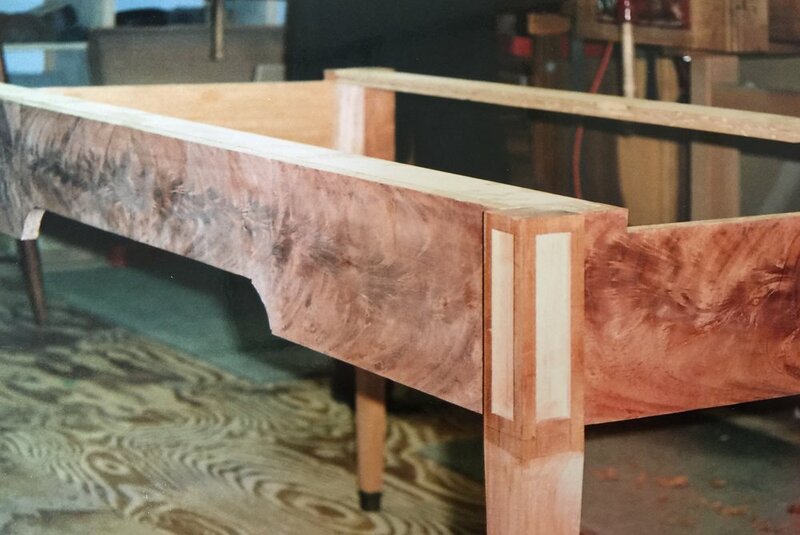 The smartest thing that I did was to make the model out of mahogany because a model made of pine or poplar would never be suitable for making a piece of furniture. This way I would have a second campaign table once the details were worked out. Fifteen years later I still need to finish the second one but I'm still happy that I have it. I have a few images of making the table, unfortunately not many but I thought I would include them here. Images of the completed table are in the previous blog post. 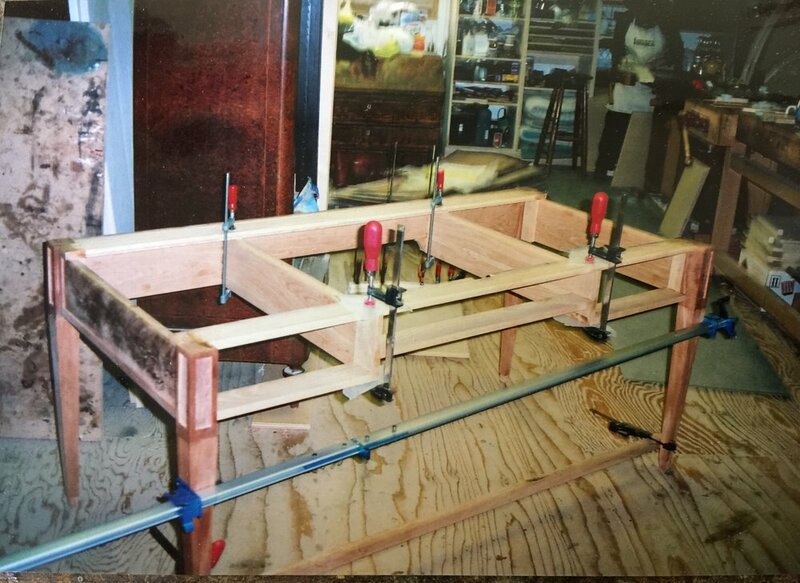 A view of the internal sliding frame assembly necessary to make this table extend and collapse. I made a jig to hold a pencil to layout the reeds for the legs. The point of this is to make sure that my scratch stock doesn't deviate from the layout lines. This lathe had no indexing mechanism so I had to make a circular plate that I divided into 10 or 12 equal sections. I then hand cut slots so that I could insert a steel scraper to lock the rotation at equal intervals. Another jig was used to hold a scratch stock to define the reeds. The final shape was cleaned up with chisels and gouges. The brass plates that hold the legs to the table were cut and shaped by hand. Bronze threaded pieces were attached to the plates with small pins. The reeded perimeter of the table top was scratched by hand with a tool that I made. This table has four sliding frames. You can see that the legs are attached to the lower frames and the table top is connected to the upper frames. The center of the table in the foreground and the mahogany model in the background. The poplar inner bits will be replaced when it is eventually made into a second table. One of my favorite pieces of furniture that I was ever commissioned to make was a dining table in the manner of Charles Stewart. The original dates to 1810 and was made to match a photograph from Nicholas Brawer's book on campaign furniture. Stewart made several models of this design of varying degrees of embellishment. Some had flat aprons, surely the least expensive. There is this model and one example that I've seen that looks like mine except that it has ebony inlaid on the top when the table is in its smallest configuration. That is the most embellished model that I have seen ( on British Antiques Roadshow nearly 20 years ago). I have never seen a box for the table but I designed one based on the many pieces of campaign furniture that I've worked on over the years. The box provides storage for the leaves when they're not in use and it serves as a coffee table. Two pieces of furniture for the price of one. I will add more formal photos to my work page in the next few months. 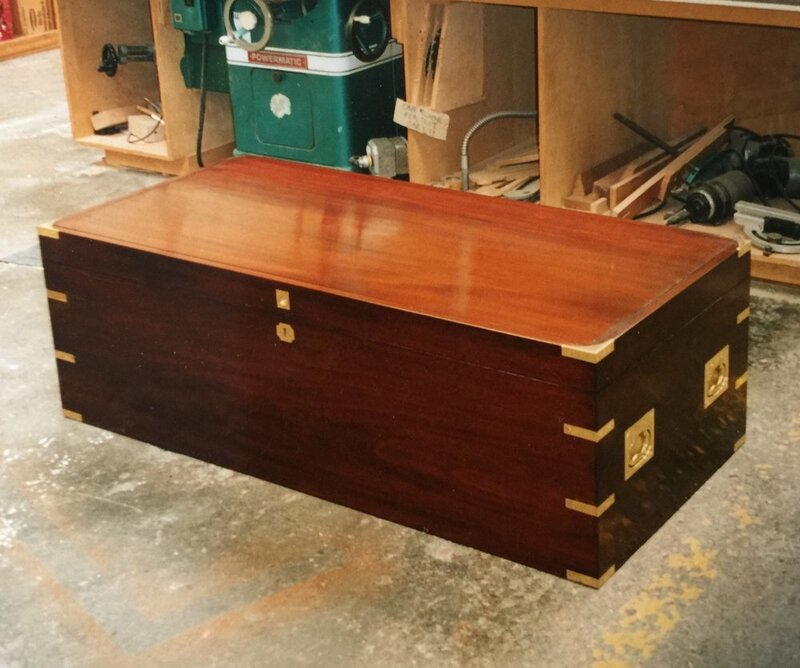 Genuine mahogany box with a nearly 28 inch wide single piece top. Open box with a locking mechanism to hold the lid safely open. The front panel removes by releasing the two brass flush bolts. The open felt lined box with storage for three leaves, four legs, six table forks and sash bolts to strengthen the table when fully open. The legs screw into brass plates that I specially made for this piece. The table in its smallest configuration. Roughly 29" high x 48" wide x 24" deep. The top rotated and opened up to seat four. The table telescopes open to over 9 feet long. The sash bolts can be seen in the photo, used to make the table very solid when fully extended. Also the quality of the mahogany I used on the apron is visible. The table fully extended can seat 14 people. The top was made from two 17 foot long 25 inch wide mahogany boards from the same tree, for consistent color and figure. Today was spent cleaning up the last of the dovetail boards and transferring the dovetails to the pin boards. The pin boards are all the vertical panels and all the joints are lapped dovetails (some people call them half blind dovetails). I also started cutting the pins after laying out each side. I'll show the process below and I will include a few details of the frame and panel construction. Using a cutting gauge to establish the depth of the tails. This is usually the thickness of the bottom and top boards. Using a different cutting gauge to establish the length of the tails. The tail board (in this case the bottom of the center lower case) being laid out precisely to transfer the tails to the pin board. Cutting close to the pencil lines. The areas with the "x" are to be removed to accept the dovetails. Mortise and tenon joinery of the frame and panel doors and sides. I've been trimming the dovetails by hand on the top and bottom boards for each of the six cases that make up this bookcase. Working with 3/4 inch oak is tough on my chisels so I keep my sharpening stones at hand to touch them up when needed. Since these are carcass dovetails, the pins ( the connecting piece to the dovetails) are fairly beefy. 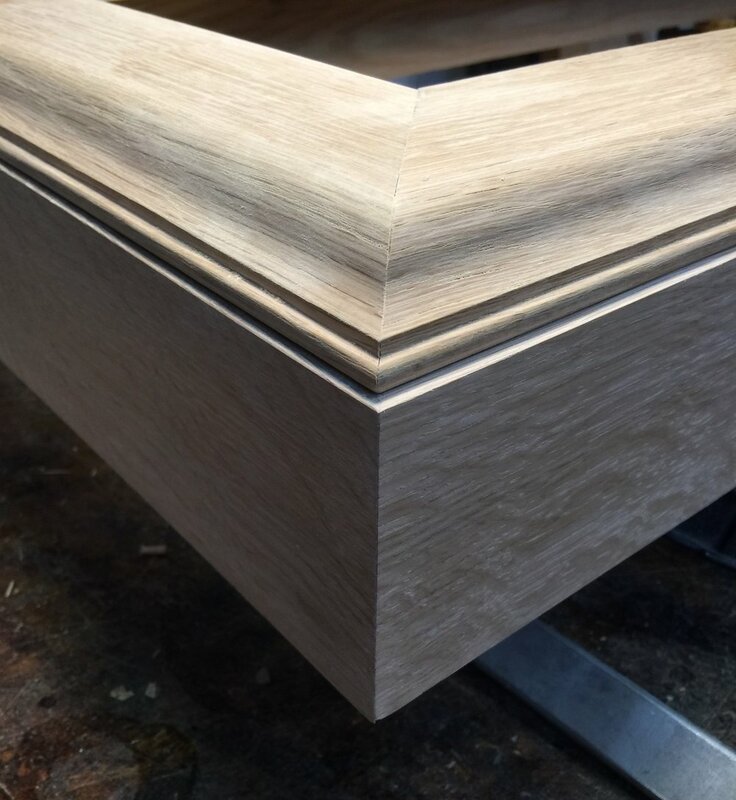 None of this joinery will be seen in the final piece but the joinery is structural and done in the same manner as an 18th century piece. It's important to me that design of the construction (interior) is consistent with the design of the exterior. I'll include some images of trimming the tails as well as some images that relate to my last post. Some of the twelve boards with the tails cut but still needing the waste material for the pins to be removed. My 1/2 scale drawing showing a partial view of the front on the left and a side view on the right. 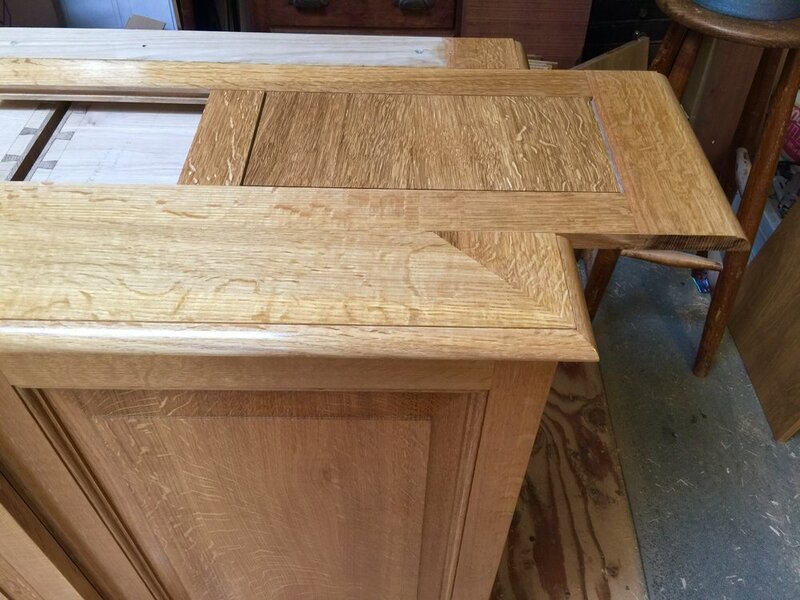 A lower side frame and panel assembly of nicely figured quarter sawn oak. The inside of the panel is flush with the frame so that books will easily slide in and out of the bookcase. Sharpening stones, honing oil and strop all at hand to touch up chisels as I work. Trimming to scribed line established by my cutting gauge. Trimmed tails on top and untrimmed tails on the bench surface. I've included an image from one of the great Charles Hayward's books showing an easy way to divide a board for pins and tails . The various cases that make up this bookcase vary in width. In an effort to find a pleasing division of pins and tails I always use this technique. It's much easier than say, dividing 18 7/8" by 7. I think that the illustration above has the tails and pins too similar in size. The tails should be wider in my opinion but the principle is the same.